This tech could let data transfer at a staggering 100 gigabits per a second. What are called the 5G or fifth-generation mobile networks are set to become available by 2020, with promises of improved connections and faster data transfer rates. But, what if we could get speeds faster than 5G before 2020? That’s the subject of a paper that was delivered this week at the International Solid-State Circuits Conference (ISSCC) held in San Francisco, California. The paper talks about a terahertz (THz) transmitter developed by the National Institute of Information and Communications Technology, Panasonic Corporation, and Hiroshima University. This transmitter operates using a frequency range from 290 GHz to 315 GHz and is capable of transmitting digital data at a rate of 105 gigabits per second — which is a communication speed that’s at least 10 times as fast as 5G networks. The transmitter uses a frequency that falls within a currently unallocated range of 275 GHz to 450 GHz. Its use will be covered in the 2019 World Radiocommunication Conference (WRC) under the International Telecommunication Union Radiocommunication Section (ITU-R). The researchers were able to reach the speed levels described in the paper by using quadrature amplitude modulation (QAM), which enhances the speed of a wireless link in the 300GHz band. 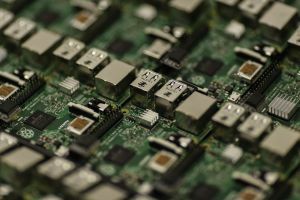 These researchers managed to, for the first time, reach speeds exceeding 100 gigabits per second with an integrated circuit-based transmitter. Most modern data transfer technologies, especially the fast ones, rely on fiber optics. This is where this new research differs. This development explores the potentials of truly wireless technology that pushes past current sluggish speeds. Today, we usually talk about wireless data-rates in megabits per second or gigabits per second. But I foresee we’ll soon be talking about terabits per second. That’s what THz wireless technology offers. Such extreme speeds are currently confined in optical fibers. I want to bring fibre optic speeds out into the air, and we have taken an important step towards that goal. We plan to develop receiver circuits for the 300GHz band, as well as modulation and demodulation circuits that are suitable for ultra high-speed communications. However, as much as this study shows promising speeds, the researchers did not cover just how much distance the technology could reach. It wasn’t also mentioned at what distance they were able to transmit at 105 gigabits per second. Speed matters, of course, but distance is equally important. Either way, this development is still an incredible achievement and a notable stepping stone to future technologies. Perhaps, while achieving speeds faster than existing fiber optics is a monumental challenge, the future of network communications is in wireless transmission.